Now that the weather is starting to get a little nicer and it’s starting to feel more like spring, I thought I should make my house a little more festive. 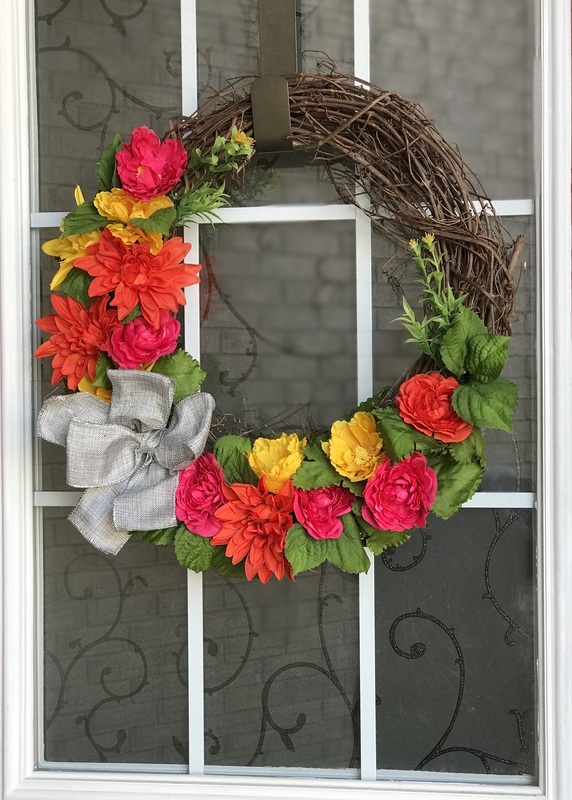 I’ve always loved the idea of a wreath for the spring time, but the ones at your local craft store cost anywhere from $75-$100 – and it’s never exactly what I want. So rather than shelling out the money to buy a pre-made one, I thought I’d make one myself. 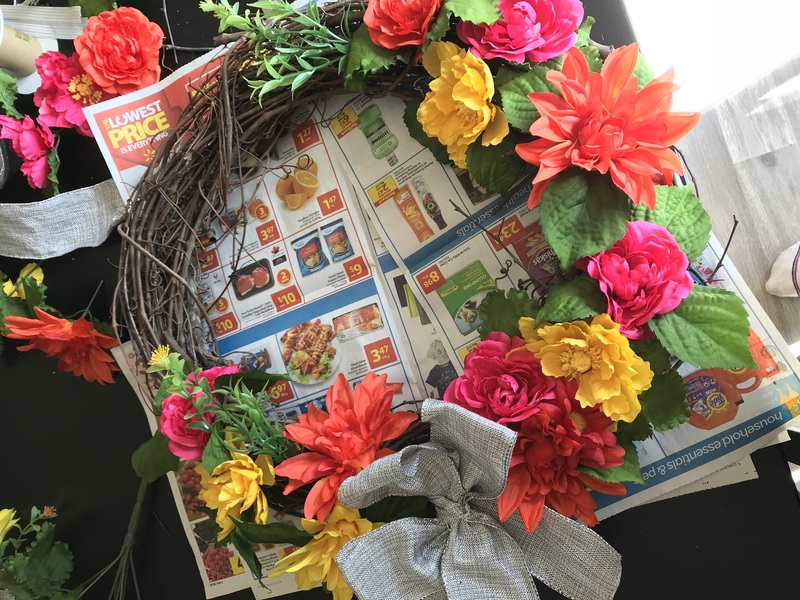 It’s actually a very easy craft to do – the hardest part, in my opinion, was picking out the perfect wreath and flowers. You can purchase all of these supplies at your local Michael’s – with my 50% off coupon and the buy one get one deal on flowers, all the supplies cost me just over $50 with tax. The most expensive supply was the glue (so if you have that and the glue gun already, it would be $15 cheaper). 1. First, you will start by making the bow. 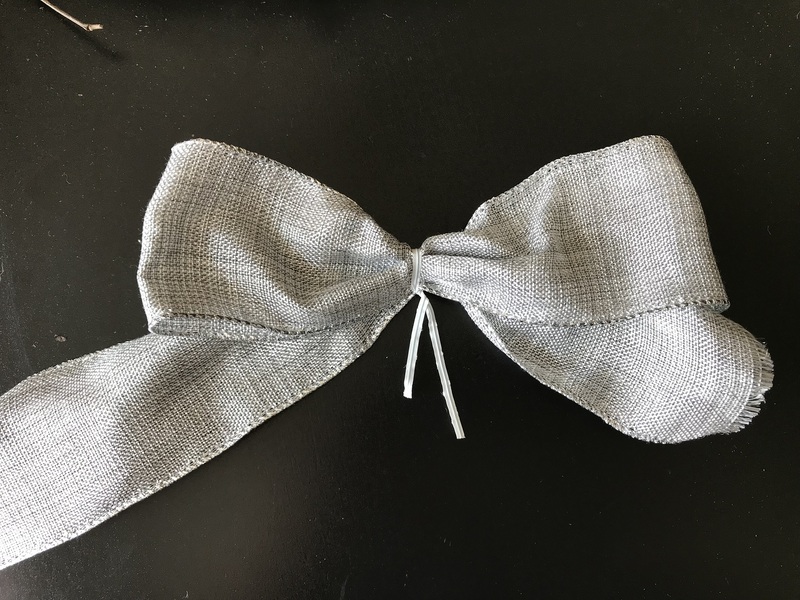 Lay the ribbon out and fold it over itself. Secure it with a twist tie. Fold it over again twice and secure it with the same twist tie. 2. Next, get some newspaper to place down over the area you are working on. The wreath will start to break apart and you will get little twigs everywhere so best to make it easier for cleaning up when you finish. 3. Take one of your bushes and push the greenery up towards the flower so you can cut them together. You can use kitchen scissors to cut them, but it would be easier with more heavy duty ones. 4. Then, instead of gluing everything down right away, I began to place the flowers around the wreath. You can begin by nestling the flowers (I left a little bit of an end when cutting them) into the wreath. This way you can rearrange the flowers if you don’t like where you originally place them. 5. While you’re placing your flowers, plug in your glue gun. It will take about 15 minutes or so to heat up. Don’t get impatient – wait until you can easily press and glue comes out. 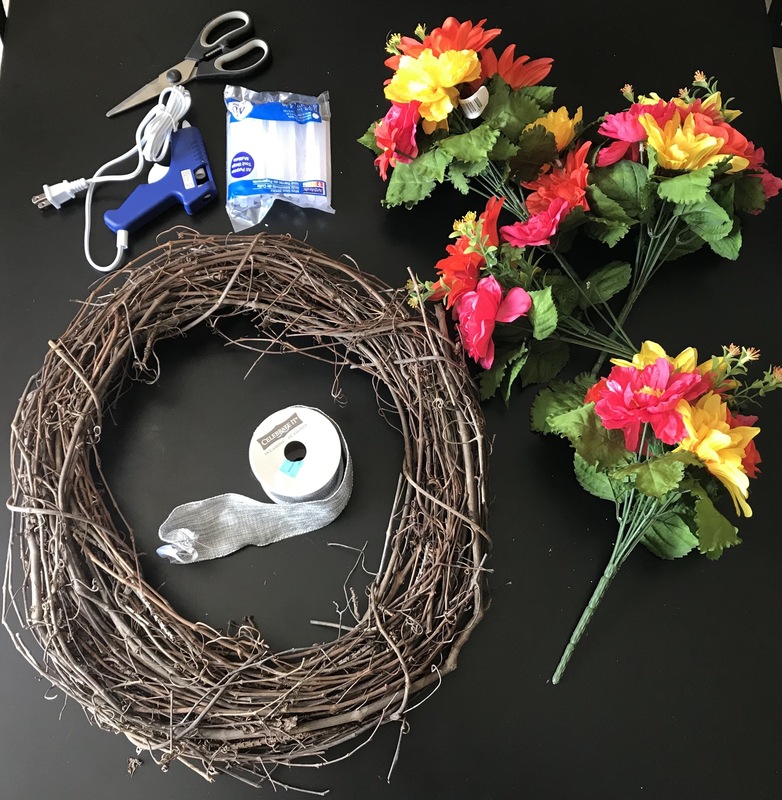 When gluing on the flowers, place the glue at the base of the flower and nestle the end into the wreath so it’s secured. Last but not least, hang your wreath on your front door! Once you’ve finished, share your wreath on your social media and copy a link in the comments below. I’d love to see how yours turns out – Happy crafting!